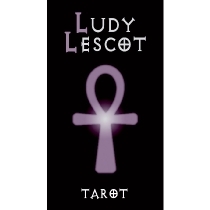 Ludy Lescot is a young esoteric and student of the arts, whom one could meet on the steamy streets in the New Orleans French Quarter. Ludy is very shy, but she unexpectedly gained renown when a few famous personalities declared that her valuable advice made a huge, positive impact on their lives. By faithfully following Ludy's notes and sketches, Patrizio Evangelisti designed a fascinating tarot deck with great symbolic power and expression, capable of touching the hearts of all who use it.